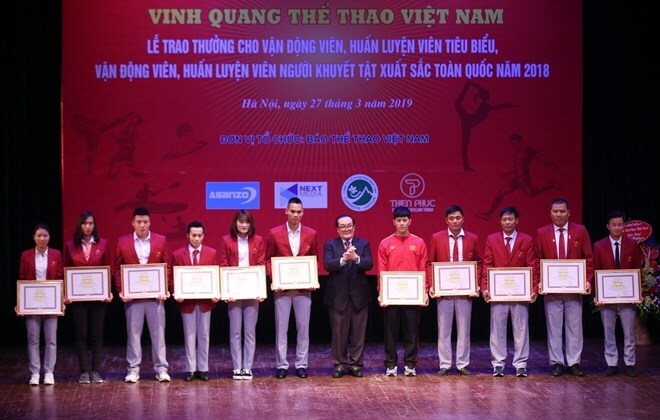 Hanoi (VNA) – Outstanding athletes and coaches were honoured at a ceremony in Hanoi on March 27, as part of activities marking the 73rd anniversary of Vietnamese Sports Day. Addressing the event, Vuong Bich Thang, head of the Vietnam Sports Administration, said 2018 marked the striking success of Vietnam’s sports sector at international tournaments. He recalled the U23 Vietnam’s finishing second at the Asian Football Confederation U23 Championship for the first time, Vietnam’s win at the ASEAN Football Federation Suzuki Cup after ten years and achievements Vietnamese athletes recorded at the Asian Games and the Asian Para Games, among others.